During the last of week of November, the Emir of Kuwait sent out formal invitations to all leaders of member states of the Cooperation Council for the Arab States of the Gulf, originally and still commonly known as the Gulf Cooperation Council (GCC), to attend the 38th summit (December 5, 2017). The rulers of Saudi Arabia, Bahrain, and United Arab Emirates, declined, sending instead political appointees of the 3rd order to represent them, which must have been seen as a personal insult to the elder Emir of Kuwait, Jaber al-Ahmad al-Sabah. I believe that this event will mark the unofficial end of this regional intergovernmental organization and perhaps the creation of a better intergovernmental organization in that region. This conclusion is not based just on the snub described above. Rather, it is based on the very reasons that led to the creation of the GCC in the first place and the motives that sustain it. The GCC was born out of fear and bigotry among undemocratic authoritarian rulers who felt threatened by any event that introduces a political process that would diminish the legitimacy of their own form of government. Throughout its history, the creation of the GCC was motivated by fear, rooted in ethnicism, steeped in bigotry, and driven by elitism. The GCC was founded in 1981, two years after the fall of the Shah and a year after the Iraqi invasion of Iran (1980), a war that lasted until August 20, 1988. Membership was limited to Arab states bordering the Persian Gulf including Qatar, Saudi Arabia, United Arab Emirates, Kuwait, Oman, and Bahrain but excluding Iraq. While one could presume that Iran might have been excluded from this organization on account that it is not an Arab country, the founders provided no logical explanation for the exclusion of Iraq, which borders the Persian Gulf as well. However, it is the original exclusion of Iraq and its exclusion from a 2011 proposals to transform the GCC into a Union that signal the sectarian bias. The GCC was formed with the aim of protecting the clan or family rule. Iraq was not ruled by a clan or family. Jordan and Morocco are. The GCC was formed to protect the interests of Sunni Muslims. Iraq was and still is a Shia-majority country. The GCC was created to preserve the supremacy of ethnic Arabs. Iran is a majority-Persian country. 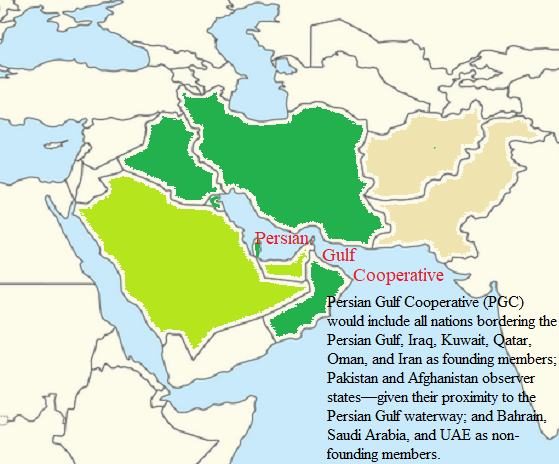 In their pursuit for promoting Arab supremacy, the founders of the GCC intentionally removed the word Persian from the name of the Persian Gulf–the name recognized by the UN and all other international organizations. The adjective “Arab” is used to name the Arabian Sea, on which the Persian Gulf opens and Iran has the longest shores along the Gulf than any other country bordering it, justifying the naming of the body of water, the Persian Gulf. The idea that the GCC was created out of fear and to preserve an outdated political order can be further supported by its rulers’ attempt to expand its membership when they were also threatened by the 2011 uprisings popularly known as the Arab Spring. Then, Saudi Arabia and Bahrain pushed a proposal to transform the organization from a cooperative into a union and invited Jordan and Morocco to join. Justifying the need for these changes, the prime minister of Bahrain explicitly stated that “current events in the region underscored the importance of the proposal. Oman and Kuwait resisted the proposal, causing it to fail. Most recently, the failure of the Saudi interventions in Iraq, Syria, and Yemen forced its rulers, again, to seek tighter control over decision making within regional organizations–like the GCC and the Arab League–to protect the clan rule from challenges spurred from neighboring countries. The drive for tighter control ruptured the artificial bond that connected the GCC member states, when Qatar refused to surrender all decision making to Saudi Arabia. While the GCC summit was under way in Kuwait city, the rulers of UAE announced that they created a “committee for military, economic, political, media, and cultural cooperation between UAE and Saudi Arabia.” This announcement is essentially a step towards the creation of an alternative, but much weaker, GCC, which would be limited to Saudi Arabia, UAE, and Bahrain. This alternative is unlikely to bring peace and stability to the region for it is still based on the same irrational fears and self-serving goals of the rulers. However, its creation may nudge the other members of the GCC to create an alternative–one that is based on inclusion and mutual interest and respect. Given the importance of the Persian Gulf to the world, not just to the region, nations bordering it should establish a new intergovernmental organization that will work to improve the quality of life of all the peoples in those countries and to safeguard the region against armed conflict and man-caused disasters. Kuwait, Qatar, and Oman should take the lead and work with the governments of Iraq and Iran to found the Persian Gulf Cooperative (PGC). Such an organization will be built on mutual respect and mutual interests, immediately bringing peace and prosperity to an estimated 100 million people living in Kuwait, Qatar, Oman, Iran, and Iraq. And when the rulers of Bahrain, Saudi Arabia, and UAE reconsider their bigoted beliefs and policies, they should be able to join in as full members along with Pakistan and Afghanistan as Observers. Together, these ten nations, would combine their abundant natural resources and vibrant, youthful societies to create better opportunities for their collective population of more than 320 million people. Because many ethnic, racial, religious, and sectarian communities live in these countries, such an organization would reduce sectarian and ethnic tension, utilize natural resources and water ways responsibly, strengthen civil society and respect for human rights norms, and enshrine cooperative leadership in a region that has been struggling for too long under unstable governments and authoritarian regimes. It will be an organization that is good for member states, good for the region, and good for the world as it inspire cooperation, mutual respect, and shared future.